We pride ourselves on our comprehensive selection of affordable, quality office furniture products. Our sales team is trained to identify your requirement & will accordingly offer best solution which will be a perfect fit for your office environment. Our manufacturing range is constantly growing with new products added often. 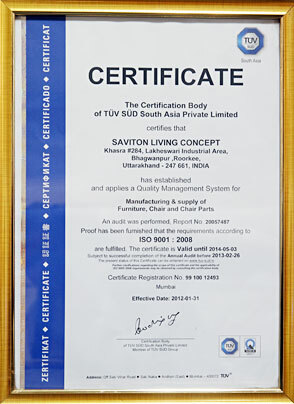 Saviton Living Concept is an ISO certified company with additional recognition in TUV SUD South Asia (P) Ltd. and UKAS and ISO/TS 16949 2002, our state of the art manufacturing units at Bhagwanpur, Roorkee and IMT Manesar ensure compatibility with international standards. Our facilities are equipped with latest technology and machinery to offer you both design & durability in our range of products for excellence in functionality and aesthetics. Quality Assurance being the main focus area, Saviton has acquired latest state of art technology to conduct random quality tests & inspection on every part of our manufactured product so that we meet customers’ expectations in compliance with various National & International standards.